Police have removed placards from peace activist Brian Haw at the scene of his five-year vigil outside Parliament. 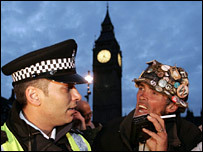 Officers went to Parliament Square in the early hours of Tuesday to deal with alleged breaches of Mr Haw's demonstration conditions. Mr Haw, 56, from Worcestershire, said he will fast in protest at the action. Earlier this month Court of Appeal judges overturned a ruling that allowed him to carry out his protest, which he began in June 2001. It meant he had to apply for police permission - which was granted on 9 May. But he was told to keep his numerous anti-war placards to within three metres - police say he has repeatedly breached his conditions. Mr Haw said: "It seems I am going to die in this place now because I'm going to be fasting and praying. "They have left me with just one placard. All of my personal belongings have been taken and dumped in a container along with nearly all the displays. "They have completely destroyed all the expressions of people who opposed the war in Iraq." Police overpowered two supporters who had climbed on top of a metal container at the side of the square to blow whistles and wave a banner declaring "Freedom of expression over political repression". Officers removed the placards at 0235 BST, saying Mr Haw had breached conditions of the Serious Organised Crime and Police Act 2005. She said: "This action follows a number of requests to the applicant to adhere to the conditions, which he has failed to comply with." The legislation bans unauthorised protests within a 1km zone of Parliament Square. It was brought in last year with the specific intent of forcing Mr Haw to abandon his post. But so far, it is only placards that have been moved, not Mr Haw himself. It is understood that any decision on eviction may be decided at Bow Street Magistrates' Court next Tuesday when he will face allegations that he breached protest conditions. In the meantime, Mr Haw plans to petition the Law Lords directly in an attempt to take his case further. Doug Jewell, from civil rights group Liberty, said: "The government's intolerance has surely reached a fever-pitch when 50 police are sent in to dismantle one man's peaceful protest in the middle of the night." Mr Haw has slept in Parliament Square among a large display of anti-war banners, placards and flags, many presented to him by well-wishers. But such a permanent fixture proved an irritant to his neighbours in the House of Commons.